« “Rainfall Epiphany” opens the Riffs of Steel: Fire Tiger compilation! “Thornwinged” featured on the Cranium Titanium Metal Radio Show! 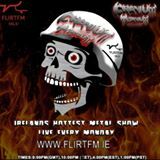 Tune in and check out the Night’s LIVE Cranium Titanium Metal Radio Show​! Anguish Sublime’s “Thornwinged” will be played along with many other great stuff!